Founders Luuk Olde Bijvank (from the Netherlands) and Dan Nikas (from Australia) are the wizards behind one of the fastest growing eCommerce brands to hit 2018 – GearBunch. In just one year, they built a multi-million-dollar online legging store with aspirations to reach $10 million by the end of 2018. With the goal to create products that people love and want, they ensure that every customer is not only satisfied but feels like they are a part of the GearBunch family. Meeting by happy coincidence, Luuk and Dan have been working together since 2014, creating a winning eCommerce strategy that is hard to beat. Dan is a Facebook advertising expert, while Luuk considers himself a design expert and a true hustler. Luuk had no formal educational background; all he knew was that he wanted to work on the internet and to work for himself. First, he taught himself web design, after which he jumped into affiliate marketing, before learning everything there was to learn about t-shirt marketing. He has now found his entrepreneurship home in eCommerce and loves Monday mornings. Their number one piece of advice for new wannabe eCommerce superstars? My partner, Dan, and I started off with a t-shirt marketing business that reached $1-2 million in sales, but after assessing how saturated the market was, we decided to look for other niches. Our strategy was to find passionate niches that we would research thoroughly and then start creating for that specific audience. 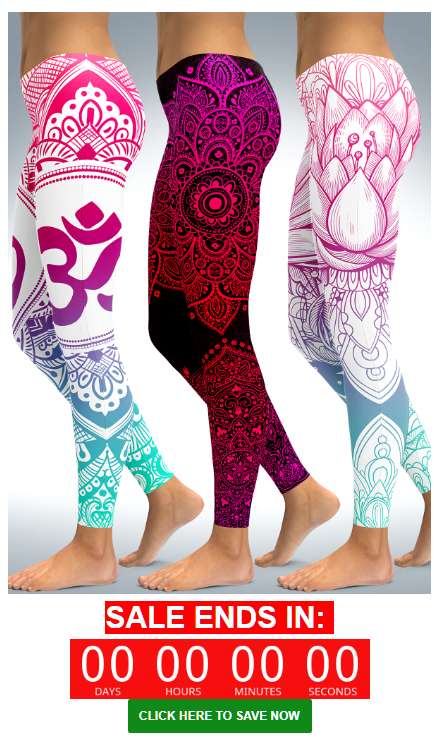 Our primary objective was to design in a way that would leave a mark, and that’s how we discovered the popular legging niche. We created GearBunch in December 2016, when we discovered legging fashion trends and noticed that there wasn’t yet a single shop that catered to very segmented niches specifically. Sure, there were big brand leggings and designer leggings, but there was a gap in the market for leggings that appealed to smaller, interest-based niches. We began marketing just before Christmas of 2016. It turned out that there was a high demand for them. It skyrocketed from there, doing over $100k in our first month, and has been growing ever since. Dan and I met virtually a couple of years ago, back in around 2014. We had both bought the same Facebook marketing course and were therefore in the same closed Facebook group of attendees. Dan reached out to the group to say that he was looking for someone to help him run his Facebook ads for him. From the get-go, we saw that with my design background and his analytical know-how, we worked very well together and then decided to partner up. We’ve only met face-to-face, in real life, five times since partnering up. We handle business by chatting on Messenger daily and have weekly Zoom meetings. Having a partner halfway across the world is actually a tremendous asset because it means having someone in a completely different time zone. This ensures that we have at least one senior partner working 24 hours a day: When I sleep, he is working. When he sleeps, I am working. Having experience with the t-shirt business gave us a good head-start on creating niche products. We knew what we were selling and to whom we were selling. With two of our main niches being bikers and Irish Americans, it was a logical step for us to test our leggings on those niches first, and therefore our first design included the lucky charm of Ireland, the shamrock. Our business motto is: If you can hit their hearts, you can hit their wallets. If you know what makes your customers laugh, what makes them cry, or what makes them feel proud, etc., and hit one or all of these emotions, you have a much better chance of selling that product. In the case of our first shamrock design, we knew that their national symbol was the shamrock and that it has three leaves, unlike the clover, which has four. We researched everything about this market to study how they think, how they talk, and what interests them. We do this kind of research before creating and launching every product design in a niche segment, ensuring we know the potential shoppers inside and out. We have come to learn a variety of things from different cultures. Understanding what works for them makes it easier to sell the product to them. With regard to suppliers, we decided to look for a good-quality print-on-demand company so that we could automate our business as much as possible. After reviewing some samples, we agreed on Printful print-on-demand, with me concentrating solely on the designs and research and Dan focusing on the marketing; everything else is automated or outsourced. Since that initial product, we have been able to automate the process as much as possible. I would automate processes WAY sooner. Nowadays, all our product images, ad images, and videos are generated with only one click – no joke. It saves me approximately an hour of work per product! Now that I have everything automated, I can spit out 15-20 new products per day, completely custom-designed. When we first started, we were pushing out a maximum of 2 per day, because everything had to be done manually. With the assistance of Photoshop automation tools (actions), we can automate a lot of the design process. Once I am happy with a design and feel it’s ready for launching, it’s a matter of one click, after which Photoshop takes over, creating all the ad images and shop product images we need. Then, with another click, we automatically create videos as well, all of which enables us to now create up to 25 designs in a single day. Also, I would have focused on conversions a lot earlier. 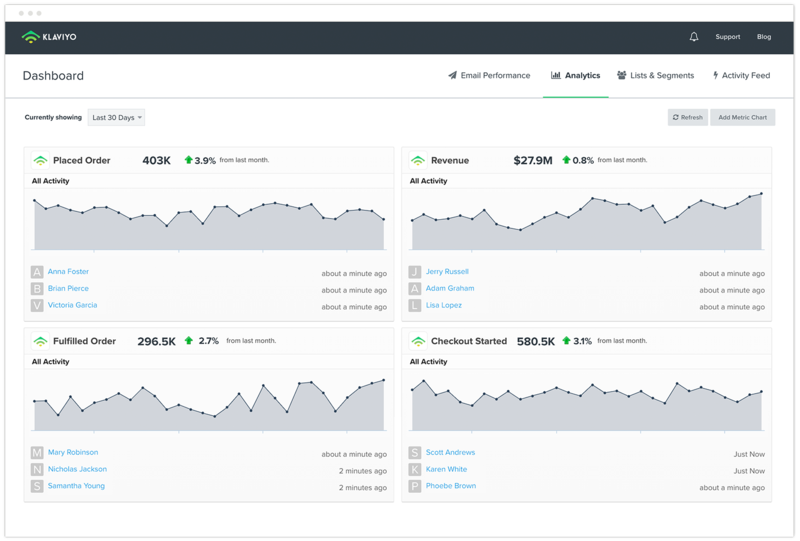 We were so busy scaling our ads and launching new products that we simply didn’t have the time to optimize the website to the fullest. Think about it: 2% vs. 4% conversion is a difference of 100% in revenue. Therefore I wish I had focused on conversion earlier. Traffic Booster: Traffic Booster handles all of our Google Ads for us, giving us excellent ROIs without any effort on our end. 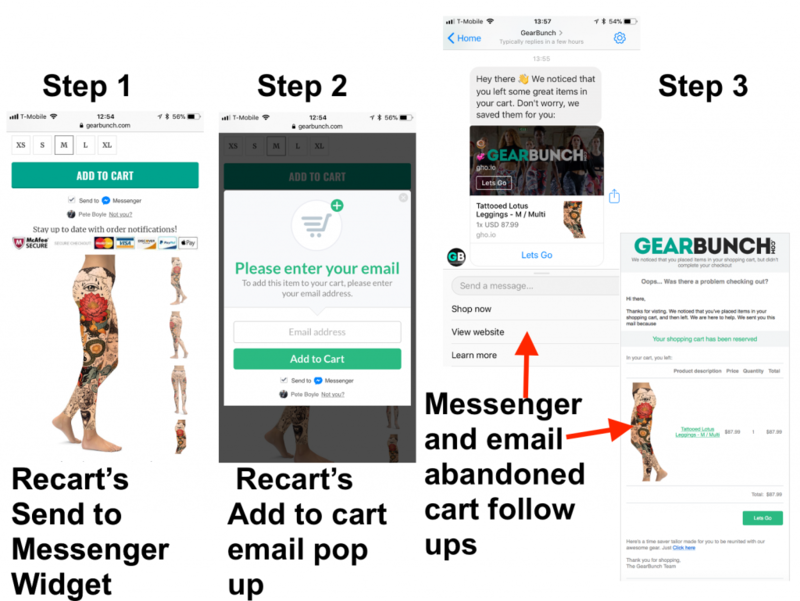 Recart: One of the apps that makes the most money for us on auto-pilot is Recart, helping us with retargeting and Messenger marketing. Klaviyo: Klaviyo enables us to create email sequences for our email marketing and provides unmatched email follow-up. Zendesk: Zendesk is our go-to for support. You can set up macros to be able to answer frequently asked questions with one click, which is a huge time-saver for our support team. We have about twenty freelance, remote staff and/or service providers who work with us. We have one support manager and two support team members who handle chat and email customer support for over 100 tickets a day. We have two additional designers who work remotely from Ukraine and South Africa. And then I have a PA, who I work with in my office, who helps me coordinate a variety of tasks from video production to launching new designs with descriptions onto our site. Then we have the StoreYa team, which runs our AdWords, YouTube and Google Shopping campaigns and we’ve just brought on someone to help Dan with all our Facebook ads. Our full-time developer and we have an external accountant, admin and social media manager in Australia. As a whole, we try to keep our team satisfied and invested by treating them like our friends and making them feel appreciated. We create real relationships with everyone by being interested in their lives, caring about them and rewarding them where and when possible. 85% of our new customers reach us via Facebook advertising. That is our bread and butter, and we see excellent results with video advertising specifically. We work with a company that helps us produce full commercial-style videos. Instead of the boring slideshows that so many marketers use, we wanted to step it up a notch by putting a lot of budget into our videos, to make them stand out. For example, the dance video we shot recently cost us around $7,000 to produce, but it has brought us well over 10 million views between all our video ad placements. We are getting around 5,000 unique visitors a day. Besides Facebook, as we mentioned, another big part of our traffic strategy is Google. Initially, we ran our Google remarketing ads ourselves, before discovering Traffic Booster. Traffic Booster runs all of our Google Ads for us, with very good ROIs: Currently, our budget there is bringing us 6 X return on ad spend, which is pretty impressive. 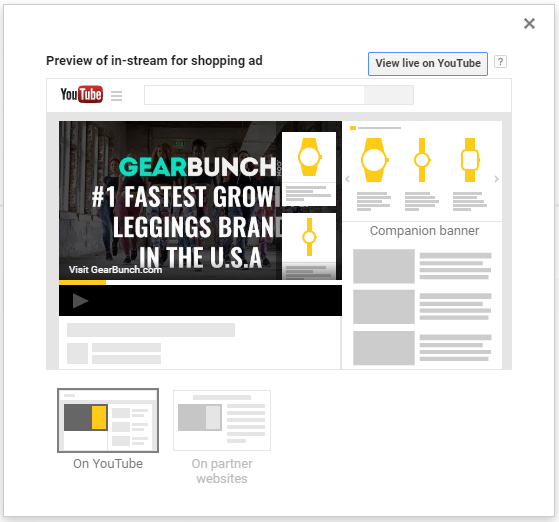 Bonus Content: What Advertising Options Does Google Offer for eCommerce? Other than that, we make sure shoppers see our ads once they have visited our website. We have set up some great strategies for remarketing to make sure we follow potential customers around with our ads. Most buyers do not buy on their first visit, so it only makes sense to put effort into getting them back until they become customers. Our advertising budget varies, anywhere from a couple of hundred dollars to the thousands, depending on whether we can scale up. Once we reach a steady ROI, we hold that budget to prevent ROI decline. Therefore, if a point on a specific product is a couple of hundred dollars a day, we stop there. But we also have had campaigns running for tens of thousands of dollars on popular products and as so many people like them, we’ve been able to keep scaling up. As a whole, we don’t mind breaking even on a product. If we make a sale and after all our costs we’ve just broken even, we consider that a win. This is because we have a high customer return rate – above 30% – and an average order value of $152, which makes our email remarketing campaigns highly successful. We do this by ensuring that customers fall in love with our brand: the designs and the quality, and our customer service. We have one returning customer who has spent $12,000 on our products and one of our main platforms for remarketing these types of customers is email marketing aside from a strong remarketing strategy on Facebook. The critical thing to remember with email marketing is that you’re talking to humans. We believe you should be speaking to these audiences as if they are your friends. We keep it personal, giving warm welcomes and feel, therefore our emails are never formal. People sign up to the GearBunch family, and we try to make them feel special. Hot audience: those who are repeat shoppers or have just bought from us. Warm audience: those who have visited our site or bought once before. Cold audiences: those who haven’t bought from us, who we’re trying to move up the sales funnel to warm and hot. We have different types of marketing options such as autoresponders and big promotional campaigns. Promotional campaigns have brought us the most success. For example, we’re about to launch our summer sale where customers can get discounts on buying leggings and our new matching sports bras. 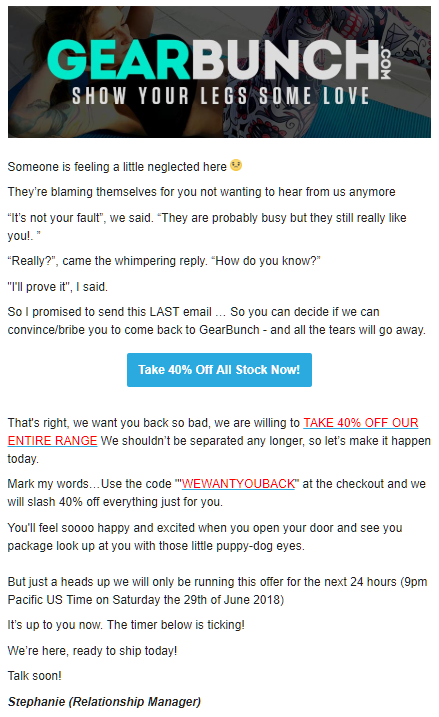 Here’s an example of a win-back campaign, which did extremely well, that was sent to people who had never bought or hadn’t bought within the last year, and resulted in over $50k in gross profit for us! We have partnered up with some big brands, which is very exciting and will move us big steps forward. We are also expanding our product styles rapidly in 2018. We started as a leggings brand; now we want to position ourselves to be an all-around activewear brand, as well as looking for additional niche products to create. There are things that no one is doing yet, which enable us to pioneer the niche and create high margin products. For example, a wetsuit can easily sell for $300 because of the quality of material, the difficulty of printing, and no one in the market is selling their own custom-made wetsuits. With regard to future marketing plans, we are busy expanding into different verticals – heading towards influencer marketing and Pinterest to enable us to widen our reach beyond Facebook and other platforms. We’re super excited to see GearBunch grow as they dominate new niches! If you’re looking for more success stories, sign up for our weekly newsletter. Also, Luuk swears by Facebook groups such as eCom Empires, Kingpinning, ShopifyPlus, and eComm Insiders, as they offer awesome networking, trend highlights, inspirations and awesome knowledge. Here is our 31 Must-Join eCommerce Facebook Groups list to get you started.